Chinese flag and Chinese Wall pattern detail. Chinese words at the back. I don't really know what does it mean. 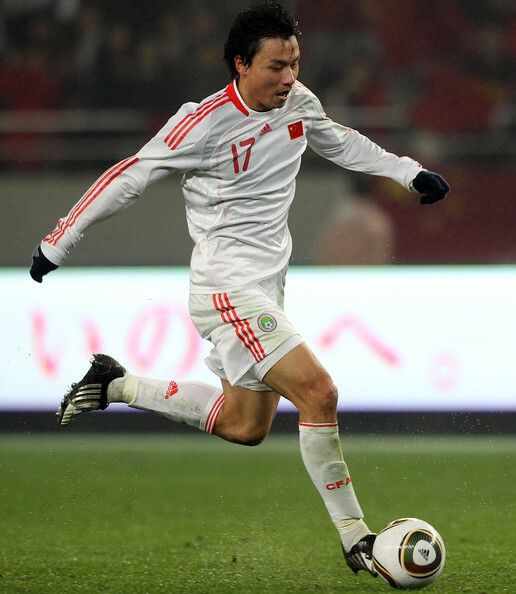 Chinese player Gào Lín during a match against South Korea. -Honours: 2 East Asian Football Championships (South Korea 2005, Japan 2010). Well, after some many busy weeks I've found a moment to post new shirts again. This one comes from Brad (whose collection you can view here), who was selling some of his shirts. I could get this one just for £10, quite a good price for a China shirt. It's a decent one, althought China shirts have been improving in the past few years. Adidas didn't work a lot on this. I'll try to keep posting my latest purchases: Nigeria (ACN Champions! ), Milan and a Santos player issue shirt.